Having recently armed myself with a video camera packed with the features a mom on the go needs (image stabilization, face capture, full HD, foot rubs on demand) I was ready for every spontaneous moment my kids could dish out. School play? Ready. Winning goal? Ready. But then I realized there will be times where my hands are otherwise occupied, and using a video stand won’t be an option. I mean, I am a mom of three boys. The new Looxcie wearable video camera is seeking to fill that hands-free gap. 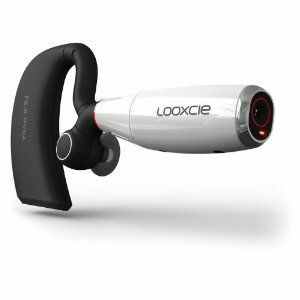 Basically Looxcie is a small headset worn over the ear that shoots 30 seconds worth of MP4 video at a time, then uses Bluetooth technology to connect and transfer video clips from the device to a smartphone or your computer so you can edit and share it. Having tried it out for a short demo, I found it like wearing a standard Bluetooth headset but slightly heavier. It’s fun feeling, being a walking video streaming machine, and there’s instant gratification watching the video of my kids on my phone seconds later. Find Looxcie online from our afiliate Amazon. It’s compatible with most Android phones now, with iPhone, Blackberry and Nokia apps being planned for future releases.